Home Yeh Hai Mohabbatein Yeh Hai Mohabbatein 17th July 2018 Written Update "Ishita Supports Raman Threaten Tanya "
Yeh Hai Mohabbatein 17th July 2018 Written Update "Ishita Supports Raman Threaten Tanya "
Yeh Hai Mohabbatein 17th July 2018 Written Update "Ishita Supports Raman Threaten Tanya. Ishita is still standing to support Raman.She says that Raman might be wrong but not this much that he may desrespect a woman. Meanwhile romy receives a call and went out to meet someone.He told that person that he had to shift some goods to his new house but can't do it today because of some kind of emergency.And asks him to shift the goods later.As the person left ishita and mihika arrived there. Ishita thanks romy and says that she is happy to know that he is supporting raman but romy replies that he is not staying there for raman but for his mummy and papa and he also asks ishita to leave Raman side as she is supporting the wrong person.Ishita said that she came there to thank him not to get any character certificate of her husband.She says that she is happy to know that romy is supporting his family but he doesnt belive raman to be his family member and leaves by saying that she is alone enough to support her husband. As ishita went inside tanya was saying that she is having proof and she will go to the police fir justice.As anyone from them is not helping her.Shagun ask her not to take ant decision in hurry.But tanya points towards ishita and says that she is Raman's shameless wife who knows the truth but is still trying to prove her wrong.Ishita ask tanya what proof she will give police if she is talking about the CCTV Footage it will only prove that raman went to her house with her in a drunken state.But the Footage can't prove that he ploted his mobile in her washroom. But she said to tanya that she may definitely go to police and show them the Footage. tanya claims that she got Raman's mobile phone in her washroom and she will show it to police.Ishita says that it doesn't prove that raman himself kept his mobile there.tanya might have took his mobile and kept it in her washroom or someone else might be hidden there who did all this.But she says it's ok tanya may go to police but what she will answer when they will ask her why she took a married man in drunken state at her home with her own will.Ishita said her to prepare fir the questions that may arise and leave from her house. 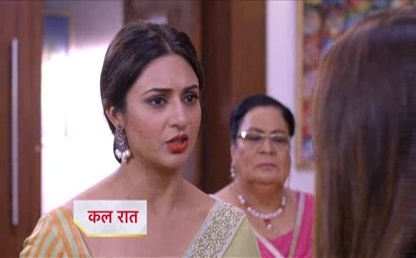 Tanya left by saying that she will definitely prove raman bhalla accusation right. Raman went to his room.Ishita too goes after him to calm him down.On the other side simmi plans to revel the matter of there family to create more obstacles for ishita. Raman was about to drink but Ishita stopped him and remembered him about his promise.She said to raman to keep faith in himself because she know that he can't ever do this.Raman asks her why she trusts him this much.How she knows that tanya is lieing.He requests ishita not to try to save him as he know he dont remember anything when he is too much drunk.He asks ishita what kind of person he became if he is Adi's father with grief of his death or his husband who is upset with her and is trying to make her wife jealous with such means.Ishita reqeusts raman to keep faith in himself as he may hurt someone or be angry at someone but he cant disrespect a woman .I believe it and i will surely prove it.When raman ask her how she says that she will find a way.At the same moment raman received a call from shweta and asks her to cancel all his meetings for the next day. Ishita snatches the phone from him and told him that he dont need to hide his face as he didn't do anything wrong. Raman holds her hand and asks her to stay with him.Ishita said that she is there with him and will definitely support him always.Raman is in deep thoughts.and highly concerned. Next morning,Mr and Mrs Bhalla ignores Raman which made him more upset.And he left for office without having breakfast even when Ishita requested him. At office Raman received a text from Ishita"All the best for meeting" He talked to himself and thanked Ishita.And left for meeting. Raman started his meeting.But suddenly heard some noise from outside.He asks his clients to wait for a moment.As he went out he saw Tanya with a large group of ladies shouting "Raman Bhalla haaye-haaye"
Ishita reaches Raman's office and listen the security guard talking to police.She asks him what the matter is.And discovered that some group of ladies encompassed Raman.They are shouting slogans against him.Ishita asked the guard to take the help of staff and don't let those ladies to harm Raman.And leaves by saying she will return soon after some arrangements. Raman asks Tanya to get out of his office and she can't trespass at his private property.But they are not ready to leave. Tanya comes with NGO Ladies to Ruin Raman's Reputation Ishita Threatens her To Reveal her Face in two Days.Raman Gets Faint.